So the story goes that back in the Qing Dynasty the governor of Sichuan, ‘Gong Bao’, had a deep fondness for this dish so they named it after him. 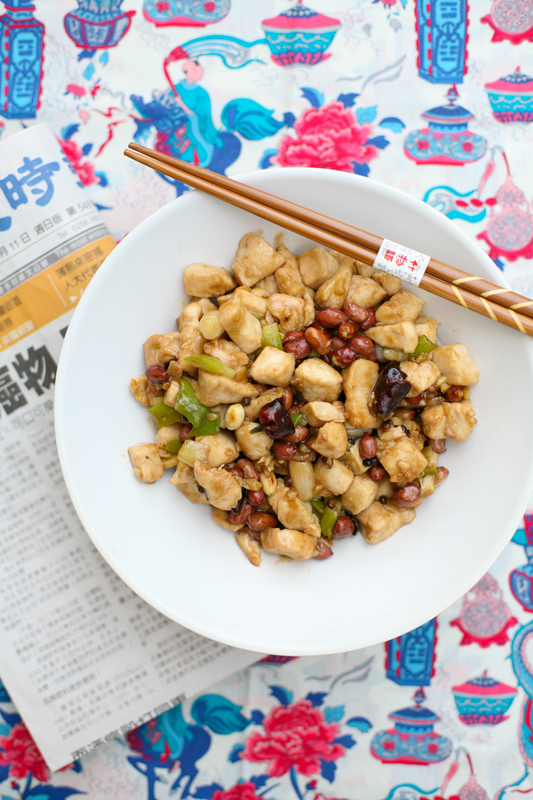 The ‘Ji Ding’ part translates as “chicken cut into small cubes” and to this day it is one of the most ubiquitous Chinese dishes eaten in both mainland China and in the West. 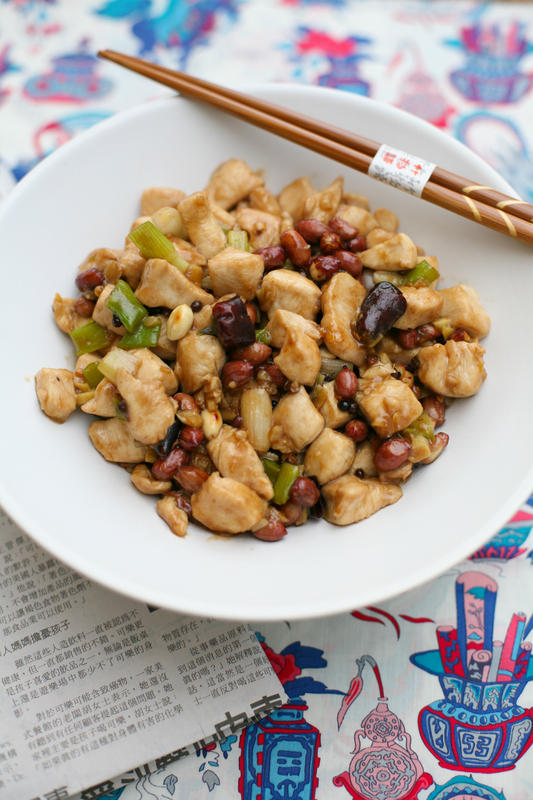 It is sometimes referred to as ‘Kung Pao Chicken’ so keep a look out for this name as well. 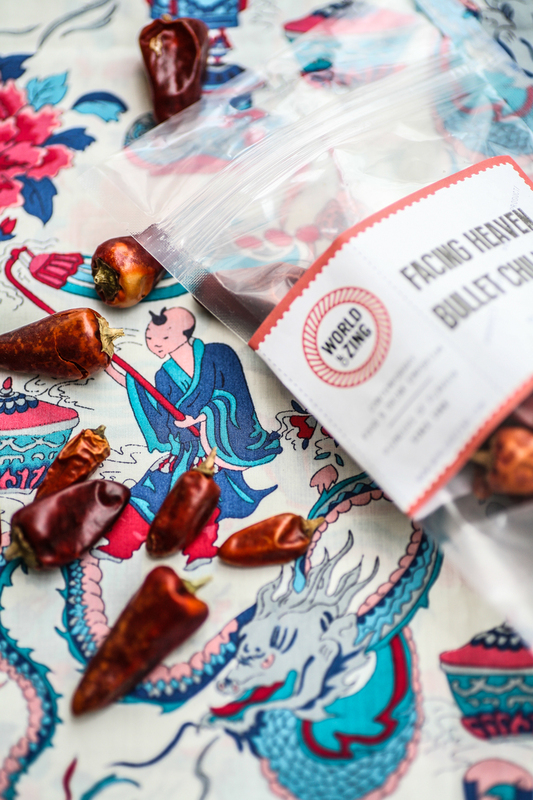 The lovely people over at World of Zing sent me some dried chillies recently with fabulous sounding names: Dragons Back, Facing Heaven Bullet and Chinese White Hunan. I pondered for some time over which one to sample first and facing heaven bullet won out. They are so called because the pepper grows with the fruit pointing upwards to the ‘heavens’ unlike most chilli peppers, which face downwards. Bullet in shape, they are often kept whole in cooking or cut in half once. Removing some or all of the seeds prior to cooking reduces the heat of the chilli, whilst still retaining a tantalising zing. To give you some idea of heat, it is far milder than a Thai birds eye chilli. It won’t be the case of running to the fridge for a glass of milk! This dish wins prizes on speed of delivery and flavour. Seriously even if you are shattered after a hard days slog this will raise your spirits. Give it a go and remember to come back and comment to let me know how you got on. 1. First prepare the chicken and then place in a bowl. Prepare the marinade in a separate bowl and then pour onto the chicken pieces and leave to rest whilst you prepare the rest of the dish. 2. Dry roast the peanuts in a frying pan for 5 minutes so that they bronze slightly. 3. Next prepare the garlic, ginger, spring onions and chilli and place to one side. 4. Prepare the sauce ingredients in a bowl and place to one side. 5. 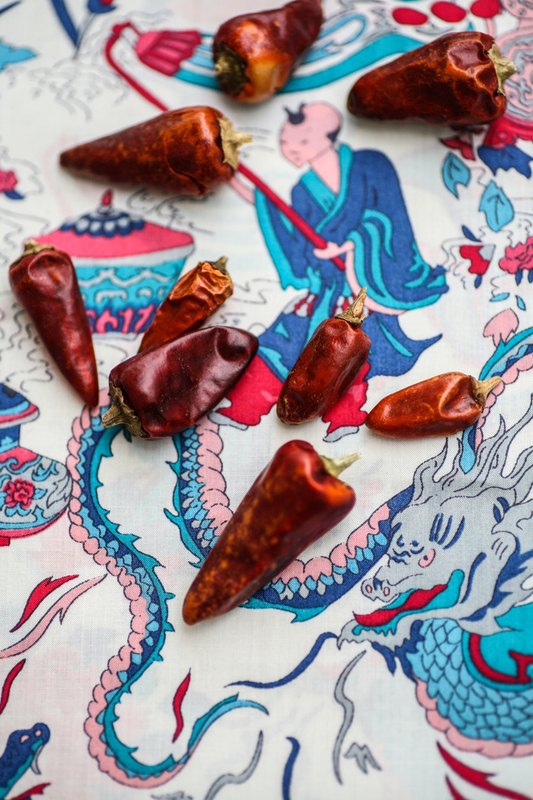 Heat a large pan or wok with the oil and when it is hot add the chillies and Sichuan peppercorns. Move them around the pan for 15 seconds before adding the cubed chicken. Keep the chicken moving around on a high heat so that it cooks through completely. 6. After a couple of minutes, and the chicken has whitened, add the spring onions, garlic and ginger continuing to move all the ingredients around the pan/wok. After 3 more minutes the chicken should be cooked completely. Cut through a large piece to check it is cooked through (if it needs a minute more continue cooking at a high heat), before adding the sauce and mixing it through completely. 7. Cook for a further minute before adding the peanuts. Coat them in the sauce and stir through a couple of times. Serve immediately with some steamed rice. Thanks to World of Zing for providing me with the chillies. This entry was posted in Chicken, Chinese and tagged chicken, chillies, chinese, spice, world of zing. Bookmark the permalink.